(PhysOrg.com) -- Prime numbers have intrigued curious thinkers for centuries. On one hand, prime numbers seem to be randomly distributed among the natural numbers with no other law than that of chance. But on the other hand, the global distribution of primes reveals a remarkably smooth regularity. This combination of randomness and regularity has motivated researchers to search for patterns in the distribution of primes that may eventually shed light on their ultimate nature. In a recent study, Bartolo Luque and Lucas Lacasa of the Universidad Politécnica de Madrid in Spain have discovered a new pattern in primes that has surprisingly gone unnoticed until now. They found that the distribution of the leading digit in the prime number sequence can be described by a generalization of Benford’s law. In addition, this same pattern also appears in another number sequence, that of the leading digits of nontrivial Riemann zeta zeros, which is known to be related to the distribution of primes. Besides providing insight into the nature of primes, the finding could also have applications in areas such as fraud detection and stock market analysis. Benford’s law (BL), named after physicist Frank Benford in 1938, describes the distribution of the leading digits of the numbers in a wide variety of data sets and mathematical sequences. Somewhat unexpectedly, the leading digits aren’t randomly or uniformly distributed, but instead their distribution is logarithmic. That is, 1 as a first digit appears about 30% of the time, and the following digits appear with lower and lower frequency, with 9 appearing the least often. Benford’s law has been shown to describe disparate data sets, from physical constants to the length of the world’s rivers. Since the late ‘70s, researchers have known that prime numbers themselves, when taken in very large data sets, are not distributed according to Benford’s law. Instead, the first digit distribution of primes seems to be approximately uniform. However, as Luque and Lacasa point out, smaller data sets (intervals) of primes exhibit a clear bias in first digit distribution. The researchers noticed another pattern: the larger the data set of primes they analyzed, the more closely the first digit distribution approached uniformity. In light of this, the researchers wondered if there existed any pattern underlying the trend toward uniformity as the prime interval increases to infinity. The set of all primes - like the set of all integers - is infinite. From a statistical point of view, one difficulty in this kind of analysis is deciding how to choose at “random” in an infinite data set. So a finite interval must be chosen, even if it is not possible to do so completely randomly in a way that satisfies the laws of probability. To overcome this point, the researchers decided to chose several intervals of the shape [1, 10d]; for example, 1-100,000 for d = 5, etc. In these sets, all first digits are equally probable a priori. So if a pattern emerges in the first digit of primes in a set, it would reveal something about first digit distribution of primes, if only within that set. By looking at multiple sets as d increases, Luque and Lacasa could investigate how the first digit distribution of primes changes as the data set increases. They found that primes follow a size-dependent Generalized Benford’s law (GBL). A GBL describes the first digit distribution of numbers in series that are generated by power law distributions, such as [1, 10d]. As d increases, the first digit distribution of primes becomes more uniform, following a trend described by GBL. As Lacasa explained, both BL and GBL apply to many processes in nature. “Imagine that you have $1,000 in your bank account, with an interest rate of 1% per month,” Lacasa said. “The first month, your money will become $1,000*1.01 = $1,010. The next month, $1,010*1.01, and so on. After n months, you will have $1,000*(1.01)^n. Notice that you will need many months to go from $1,000 to $2,000, while to go from $8,000 to $9,000 will be much easier. When you analyze your accounting data, you will realize that the first digit 1 is more represented than 8 or 9, precisely as Benford's law dictates. This is a very basic example of a multiplicative process where 0.01 is the multiplicative constant. Significantly, Luque and Lacasa showed in their study that GBL can be explained by the prime number theorem; specifically, the shape of the mean local density of the sequences is responsible for the pattern. The researchers also developed a mathematical framework that provides conditions for any distribution to conform to a GBL. The conditions build on previous research, which has shown that Benford behavior could occur when a distribution follows BL for particular values of its parameters, as in the case of primes. Luque and Lacasa also investigated the sequence of nontrivial Riemann zeta zeros, which are related to the distribution of primes, and whose distribution of the zeros is considered to be one of the most important unsolved mathematical problems. Although the distribution of the zeros does not follow BL, here the researchers found that it does follow a size-dependent GBL, as in the case of the primes. The researchers suggest that this work could have several applications, such as identifying other sequences that aren’t Benford distributed, but may be GBL. In addition, many applications that have been developed for Benford’s law could eventually be generalized to the wider context of the Generalized Benford’s law. One such application is fraud detection: while naturally generated data obey Benford’s law, randomly guessed (fraudulent) data do not, in general. More information: Bartolo Luque and Lucas Lacasa. “The first digit frequencies of primes and Riemann zeta zeros.” Proceedings of the Royal Society A. doi: 10.1098/rspa.2009.0126. • Join PhysOrg.com on Facebook! • Follow PhysOrg.com on Twitter! What should I say about elementary number theory? Intriguing. But this only pertains to the first digit. Perhaps they should normalize the numbers using an exponential base instead of 10. Until we know, we don't know. Primes are something so simple in concept yet we cannot predict them. The knowledge gained in doing so may shed light on things we cannot yet conceive of. Progress! Yes it matters. If we could find the true nature of primes and their distribution, then we can also do the same for non-primes (composites). I have to agree with SMMAssociates 42 solves everything! One practical application of prime numbers is computer security. Were a pattern identified to them, they would be much easier to generate, and therefore much easier to attack. Security would get magnitudes harder to maintain. This book is said to have discovered an easy way to calculate primes. McCanney says this discovery may weaken the backbone of Security Coding and Encryption, which is based on the characteristics of prime numbers. "James M. McCanney, M.S. Physics" HA! Anybody who must settle for an MS rather than getting a PhD in Physics does so because they do not have the math skills ... and this guy write a book on how to "calculate" prime numbers! The irony is hilarious! BTW, one can not "calculate" prime numbers one can only search for them. Sorry, Jimster, but Mr. Jancik is spot on. You're quick to launch a personal attack on Jim McCanney but, like most debunkers, you don't do your homework. McCanney is a decade ahead of his contemporaries with groundbreaking works like "Calculate Primes." Read it. You might learn something. Part of McCanney's brilliance, also, is the ability to explain complex principles to the layman, a talent sorely lacking in scientific circles. While naysayers like you spend time huffing and puffing, Jim McCanney writes scholarly books and offers a weekly science podcast, at no cost to the public. Really, Jimster, what have YOU done for science lately? When you were in diapers, McCanney was lecturing at Cornell. For those seeking a better understanding of Earth's weather, I would highly recommend another McCanney book, "Principia Meteorologia: The Physics of Sun Earth Weather." "Anybody who must settle for an MS rather than getting a PhD in Physics does so because they do not have the math skills"
it does not seem that you even bothered to read his work before choosing to mouth-off! I believe there is a pattern to all things real and imaginary. It is through these real patterns that the human brain is capable of creative thought and perhaps, just perhaps, to opening all the secrets of the universe. "Anybody who must settle for an MS rather than getting a PhD in Physics does so because they do not have the math skills ... "
Jimster, can you prove this? Amazing at the level of ignorance being displayed by that comment, well more disappointed than amazed. There are many reasons for getting an MS over a PhD. I don't know much about 'Prime Numbers' except what they are like divisible by only 1 and themselves like: 1,2,3,5,7,11,13, etc. And that there is a formula for finding the 'Prime Numbers' between numbers 1 and 97. -After 97, the formula falls apart. 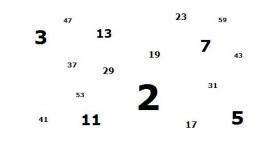 Maybe, someone, someday will complete the formula so that every 'Prime Number' can be found. Though, Not really sure why we would want that formula, but anyway- its something to do. I have discovered a remarkable method for quickly determining the primality of any integer, but unfortunately space limitations preclude me from including it in this comment. If you were dealing with a binary, hex, or other non-decimal based system, do primes exist? Yes they do. It's an abstract mathematical concept that doesn't depend on the representation. Not 42, not 21:22 interface; obviously it's in the digits of transcendental numbers, especially PI. I didn't read all the comments so I hope I'm not being redundant, but I know a bit about math and it looked like some people were looking for explanations of the importance of primes. First of all, they stand out to us on an intuitive level because of the unique property of not being divisible by anything. There is something very fundamentally significant about that. If you don't relate to the formal interest, it's hard to explain exactly "what we need them for" of "what you can do with them." Things generally work in the opposite order. We discover new mathematical ideas, then we discover that they lead to new scientific advances. For example, extensive formally-motivated studies of the complex numbers ended up providing models to support electric current flow, as well as aerodynamics. Of course, we didn't know this is where it would go when people were first asking questions about the square root of negative one, because those branches of science didn't exist yet. But I'm sure there were people then who said "who cares, it doesn't pertain to anything." I saw a couple of comments in re: what practical applicability this could have? Look no further than fraud identification. To those who say they have no interest in this field - I say stick your head back in the sand where it belongs. This affects us all. Arguably the greatest threat our society and general status quo faces resides in our banking system. Right now fraud is being committed by the major banks and possibly even quasi governmental entitities (Federal Reserve). If and when people lose faith in the fiat currency systems currently in place, dangerous changes become quite possible - barter economies, political regime failures, etc. As such, rooting out fraud and exposing the bad actors becomes all the more necessary. The way I think of it is that prime numbers are the only fundamentally "real" numbers since all other numbers are made of them. Just as particle physicists work to understand the fundamental nature of matter, energy, and ultimately the universe through the basic building blocks of reality, so mathematicians working with primes want to understand the underlying fundamental nature of numbers. This is particularly exciting when you consider that the rules of math may transcend this universe. We speak of the laws of nature, like gravity, inertia etc. but these are probably functions of the universe. The universe, however, may well be a function of math. For numbers like primes, the percentage with leading digit 1 depends greatly on where you truncate. If you look up to 10^k or up to 9.9999 * 10^k, you get a very different answer. One solution, related to a comment above, is to look at these numbers with analytic and not the natural density. Using these weights, it has long been known that Benford's law holds. See Serre's classic "A Course in Arithmetic", page 76 (where Serre refers to a comment by Bombieri). Whoops - typo in what I wrote (that's the problem in quickly posting when running to get the kids from daycare). It should read the answer looks very different if you go up to 2 * 10^k or up to 9.9999 * 10^k; in the first we've just gone through a long stretch of 1s, in the latter we've just gone through a long stretch with no 1s. The standard example is to look at the distribution of leading digits of the integers in [1,n] as a function of n; it oscillates between (roughly) 5/9 when you stop around 2 * 10^k and about 1/9 (when you stop around 9.9999 * 10^k), or something along these lines. He did poorly at academics and was critical of its creativity stiffling structure - even failing a school entrance exam. Eventually at 26 he got his PhD but he struggled with the rigidity of academia. The PhD was given after his most important works. There is a fascinating discussion related to this in "The Music of the Primes" by Marcus du Sautoy, pp.202-202, regarding how the Riemann conjecture would end up proved if someone found it is "undecidable". Primes are very important. So much so that the sheer magnamousness of their importance is well beyond human comprehension. Seriously, we'd have to evolve into a pure energy-state in order to truly grasp their significance. BTW, I don't think "magnamousness" is a word. By George, I think you have got it. Now what do we do with it? Just asking. Well I'm flattered that you think I would know the answer to that. Of course no one does really. Or you could always start with Wikipedia. Uhmm.. yeah... it's called "humor". Perhaps you've heard of it? ultimately everything balances out,therefore any patterns are false and invalid in the proper scheme of infinity. Using the number 5 in all calculations,never deviating, will make things much easier to prove my point. "Everything in the universe relates to the number 5, one way or another, given enough ingenuity on the part of the interpreter."